MPR: Should the Mississippi River gorge be restored? St. Anthony Falls in the late 1840s. Should the Mississippi River gorge be restored? A historic flotilla of paddleboats arrives in the Twin Cities Saturday marking the 150th anniversary of the original Grand Excursion. The event in 1854 celebrated America's first railroad connection to the Mississippi River. More than 1200 people, including former President Millard Fillmore, traveled by rail from Chicago to Rock Island, Illinois. They then boarded steamboats that brought them upriver to St. Paul. The boats couldn't go any further because of miles of rugged rapids and the Falls of St. Anthony. The delegation traveled by horseback and wagon the last few miles of the trip to view the celebrated limestone falls. Today the natural waterfall is hidden by a concrete spillway and the rapids are gone. The changes were made to harness the river's power and allow navigation. But there is a movement to restore them and return the river to its natural course. Minneapolis, Minn. — From his vantage point on the historic Stone Arch Bridge in downtown Minneapolis, Dean Rebuffoni gazes at the rush of water spilling over the dam at Upper St. Anthony Falls. "I look at it and say, 'Geez, it's kind of splendid in a sense. But so's the Empire State Building.' But those are manmade things. They don't last. It's not the grandeur of a waterfall. It's not the grandeur of a river." Rebuffoni is a member of Sierra Club. His chapter is asking the Legislature for $100,000 to study whether it's possible to remove this concrete spillway and dam and expose St. Anthony's natural limestone falls underneath. The group also wants to rip out two other locks and dams below St. Anthony and allow the river to flow freely. "Well, the simple fact is that dams kill rivers. Now, we're not saying remove all dams. But the impact of these dams and these locks on this river has been tremendous," Rebuffoni says. Before the locks and dams were built, the Mississippi between St. Paul and St. Anthony Falls was more like a mountain river. Water rolling off the falls surged through the narrow limestone and sandstone gorge below for about eight-and-a-half miles. From the top of the falls to the bottom of the gorge, the river dropped 111-feet in elevation. "It's the steepest drop anywhere on the Mississippi River through the tightest canyon anywhere on the Mississippi River," said National Park Service Historian John Anfinson. "The gorge, naturally you would have seen at high water, this water jumping off these big boulders and creating a very rough rapids. It would have been almost impossible to get up it in any kind of a vessel." That didn't stop some daring explorers from giving it a try anyway. There's the case of Stephen Long. "When Stephen Long comes up in 1817...he's got six men rowing on his six oared skiff. He's got someone poling. He's got a sail up with a good wind behind him and they get into the gorge and they can't make anymore headway," said Anfinson. "They have to have someone get out of the boat, tie a rope around a tree and pull the boat up the gorge." Today, gorge visitors don't even break a sweat. Minnesota DNR River Ecologist, Mike Davis maneuvered his boat to the left side of Lock and Dam One in St. Paul on a recent summer day. "Now, to go through the locks you have to come over to the side and pull on a cord and it signals that you want to go through the lock chamber." Lock and Dam One was built in 1917 by the Army Corp of Engineers and backs up water in the gorge all the way to downtown Minneapolis. Navigation ended there, at St. Anthony Falls, until the 1950s and 60s when then-Senator Hubert Humphrey convinced Congress to pay for two more locks. Humphrey wanted to get barges over the waterfall so Minneapolis could cash in on the booming river trade. Barge traffic did come to Minneapolis, but it never brought the prosperity that Humphrey predicted. The locks do make it easy though to navigate what was once a treacherous river gorge. All that's required is a little patience. "Good morning," a lock worker calls to Davis over an intercom. "Can you hear me down there?" "It'll be about 10, 15 minutes. Just wait for a green light and stay on your left hand side and we'll get you a rope,"
After getting clearance to enter the lock, it takes another 10 minutes to raise the water level. A horn signals when it's okay to move into the next section of river. Mike Davis has spent a lot of time on this stretch of the Mississippi. He's been trying to figure out what can be done to improve the habitat. The locks and dams changed the ecosystem dramatically when it erased the rapids, which were a major spawning area. Like the Sierra Club, Davis thinks restoring the rapids is a sound environmental idea because it might bring back the big native fish - like sturgeon, catfish and paddlefish. A hundred years ago, those fish were common here. "It seems like it's worth re-assessing everything after a century you know," said Davis. "Maybe there are other ways to do the things that are so dependent now on this river being locked up and buried. To me the rapids is a buried treasure, waiting to be revealed again." Davis and a group of other state and federal officials recently proposed the idea of restoring the rapids as part of long-range environmental goals for the Mississippi River, called pool plans. The gorge is in the area known as Pool one. But the plan is stalled. "It's in direct conflict with the nine-foot channel navigation mission. At least that's what the Corp determined and probably it's true," said Davis. "So even though it's included in there, it was not officially endorsed as something to pursue at this time. I think the language says something about if the opportunity presents itself in the future, which to me says if there's no longer a Congressional mandate for a nine-foot channel here, then it would become feasible to consider it. So, there's some roadblocks." If the rapids were restored it would certainly mean the end of barge traffic up to Minneapolis. Each year the industry uses the navigational channel to move about two million tons of sand, gravel and other products through the locks at St. Anthony and Lock and Dam One. That's not a huge volume. But David Raasch with the Army Corp of Engineers in St. Paul said it's enough to make it worth operating the locks. Still, Davis thinks the Sierra Club's idea is interesting. "They have laudable goals. I've seen and I've read what they're looking at and they have some very good, valid arguments," said Raasch. "But it has to be balanced with other competing interests which also have valid and very good arguments." Another of those competing interests happens to be the biggest taxpayer in Ramsey County. Ron Gray, a manager at Ford's Twin Cities Assembly Plant in Highland Park, said Ford Motor Company located in St.Paul because of hydro power provided by the river. In the early 1920's, city leaders traveled to Dearborn, Michigan to ask Henry Ford to build a plant in St. Paul. The offered up the hydro dam at Lock and Dam one as incentive and Ford readily took them up on their offer. Today the hydro dam generates about 13 megawatts of power, enough to supply nearly all of the power Ford needs to build its Ranger pickup trucks. If the hydro dam was shut down, Ford's costs would go up marginally, according to the company, if it had to buy power off the grid. But that's not what concerns Ford the most. Ironically, the stumbling block is a competing environmental concern. "If that were removed, we would have to purchase the power through either a coal burning facility or a nuclear facility or something else," said Gray. "So the benefits have to be weighed at both ends and you know comparing ourselves to other facilities, that is one thing that's really on our side is a clean, renewable source of power which you know keeps this plant in a good light." Gray said it's too soon to say what Ford would do if the plan moves ahead. The plant employs 2031 people. The idea of restoring the Mississippi River gorge faces many other challenges, too. It would be expensive. A study hasn't been done yet, so no one is sure exactly how much it would cost. But there remains an even more intriguing dilemma: whether the natural falls at St. Anthony can be restored. 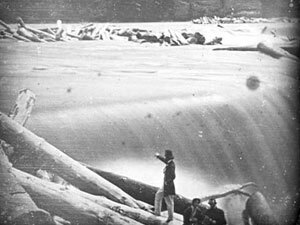 If the Army Corp hadn't protected the waterfall with a concrete barrier in the 1850s, it might not exist today. At that time, the limestone falls were retreating upstream at a rate of 26 feet a year. Fewer than 1200 feet of limestone remain and geologists say it's very fragile. Bringing St. Anthony Falls back would probably take a monumental effort -and require lots and lots of man-made materials.